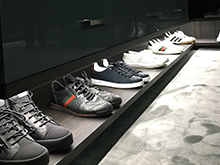 When it came time to dramatically update his master closet, well-regarded entrepreneur Wayne Chang and his interior designer Eileen Keshishian turned to California Closets Los Angeles design consultant Katharine Mills-Tierney to reimagine the space. 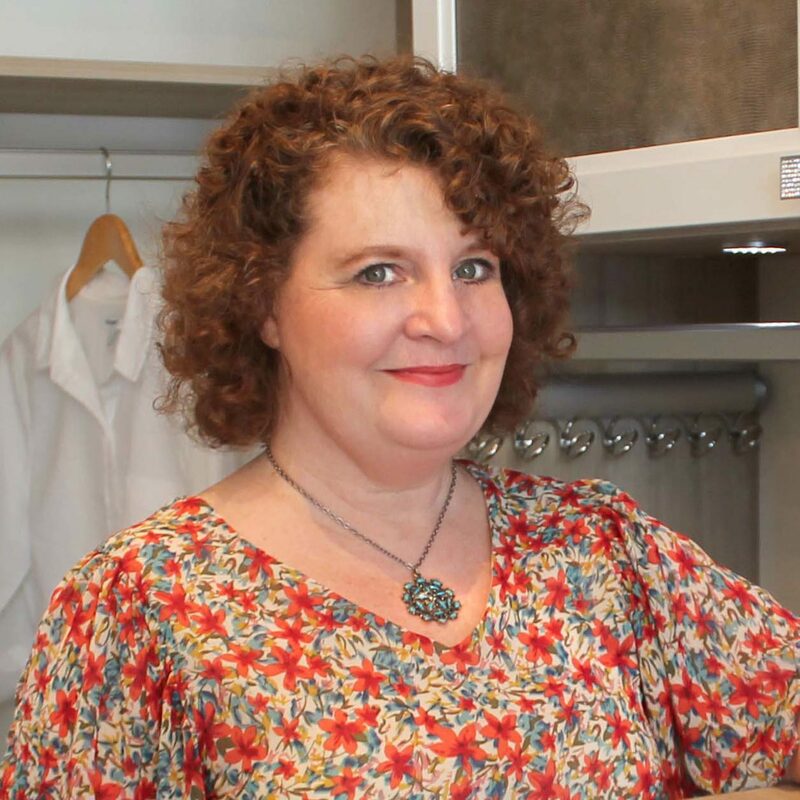 Katharine worked with the room’s awkward layout to create a custom design that would give Wayne the sleek and contemporary gentleman's closet he desired. Collaborating closely with Wayne and Eileen to incorporate inspiration he drew from a famous Hollywood movie, Katharine presented a plan that would improve function and reflect similar cinematic visual impact. 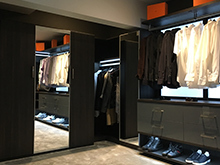 I enjoyed taking on the challenge of turning a space of odd angles and beams into a streamlined and upscale dressing room. 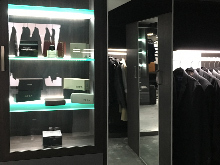 Throughout the space, lighting was carefully designed to achieve the desired dramatic effect. 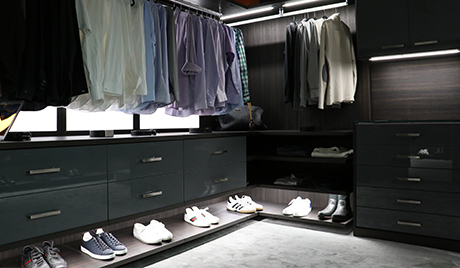 Katharine used LED lighting above the wardrobe poles, as well as along the bottom of the closet, and installed LED-lit panels behind Wayne’s hanging wardrobe to create the closet’s focal point. 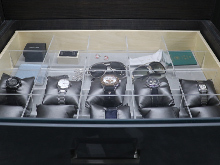 Katharine also incorporated lit glass shelves behind a framed glass door for enhanced display. Finally, to cleverly hide an existing access door on the back wall of the room, Katharine added a mirrored door and flanked it with mirrors on the side walls to achieve a 3-way mirror effect. The entire system’s Tesoro™ Cappuccino finish added richness and depth, while complementary grey acrylic doors and drawer fronts, and lustrous, brushed nickel hardware further enhanced the design. 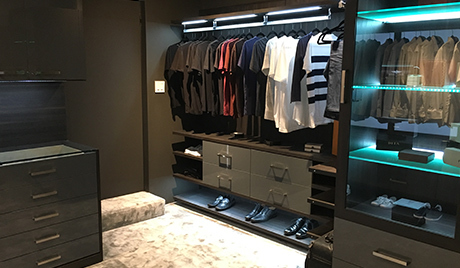 Finishing touches including a plush charcoal carpet and a dark paint color on the walls helped to complete the room and augment the closet’s design transformation. 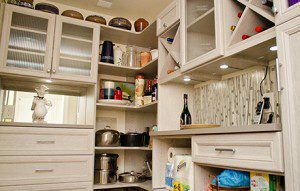 was one of the easiest parts of the remodeling process. 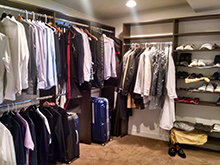 The custom design of this master closet echoes the client’s vision for style, order and modern simplicity.